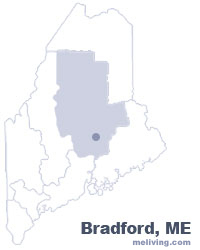 Bradford, Maine is a bedroom community of the greater Bangor metropolitan area. A rare tornado hit the town in 1872, destroying two house before going onto neighboring towns of Dover and Parkman. To share any Bradford, Maine information with us, please contact us. Learn more about advertising in MELiving.